As giddy as a schoolboy. (Picture Alastair Sim skipping around as Scrooge on Christmas morning.) That’s how my husband described me when we finally arrived at Hunting Brook Gardens on Lamb Hill near Bellington in the Wicklow mountain foothills. It had been a long time coming. 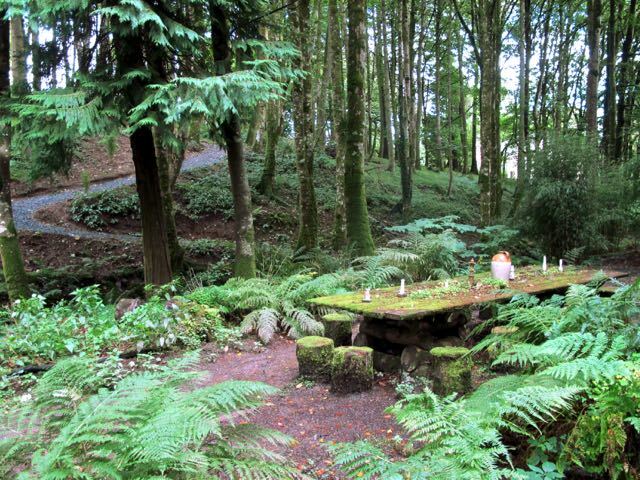 Four years ago, I’d tried, tried hard, to persuade my travelling buds in Ireland to visit. No dice. Now, it was our last full day in the country. And it was raining. Who cared? Not me. 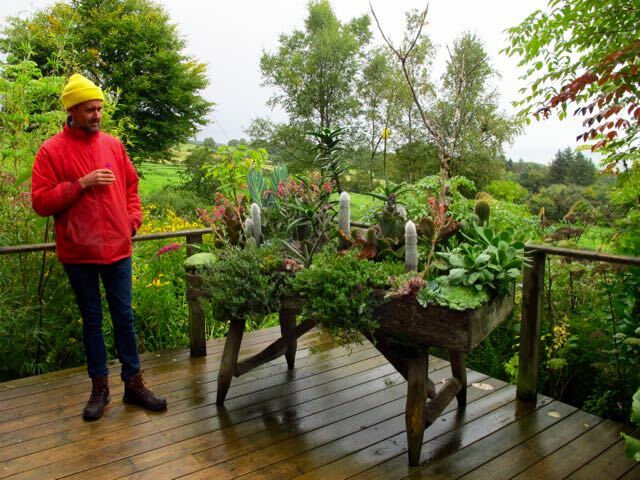 September 10th was an open garden day, with creator Jimi Blake on site to talk about his plants and garden. Nothing short of an apocalypse would keep me away. So Mr. TG indulged my mania enthusiasm for the 90-minute drive to the garden, armed with raincoats, huge umbrella, and definitely the wrong shoes*. 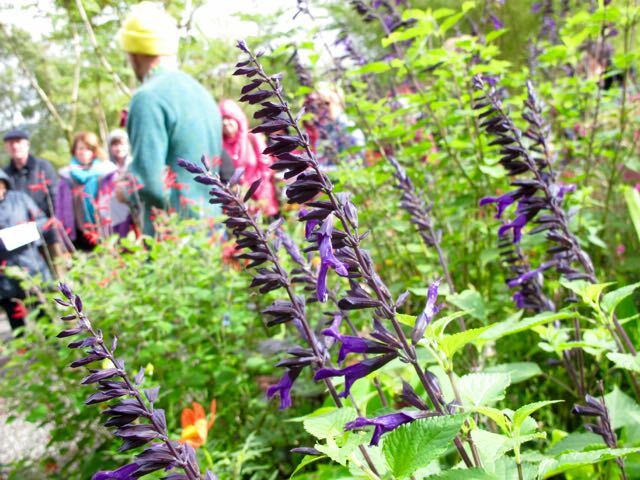 Jimi Blake talked Salvias – and, later, September plant favourites – to a rapt, if soggy, gaggle of fans. Hunting Brook! What can I say? If Phil Spector’s Wall of Sound were a garden, this might be it: full of individual detail but in a density that almost overwhelms. Where should I point my camera? How can I be everywhere at once? Giddy? I was almost levitating. 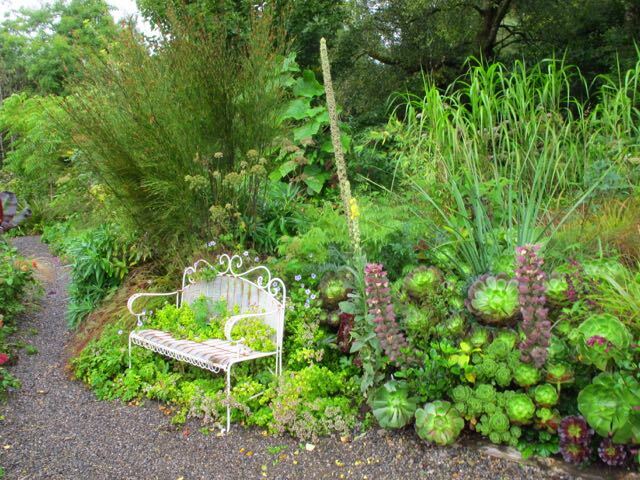 The first sign this isn’t gardening-as-usual: spiky Acanthus rocketing through huge Aeonium rosettes. The rain fell, the wind blew, but I was bewitched. 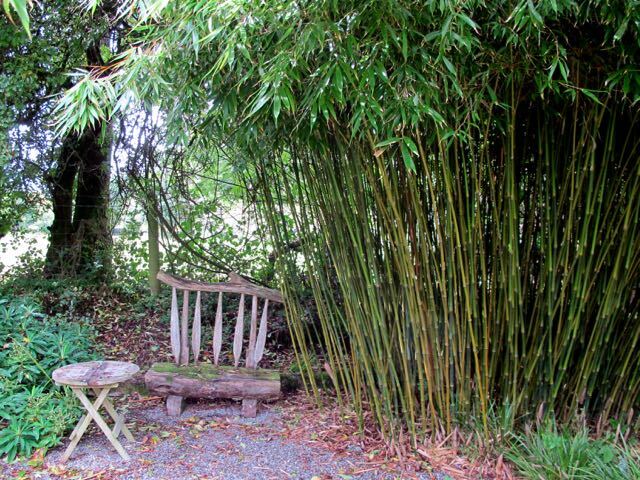 See how the leaves and stems are rustling in these pictures? Luckily, a quick look at my camera settings showed me that low light under the clouds was causing camera shake and blur. Oops. Not another memory card full of camera photographer malfunction! But the picture below does help show what it felt like to be in the middle of all that sensory input. Can you spot Mr. TG coming to tell me to come back to earth? Jimi’s first talk was about to start. 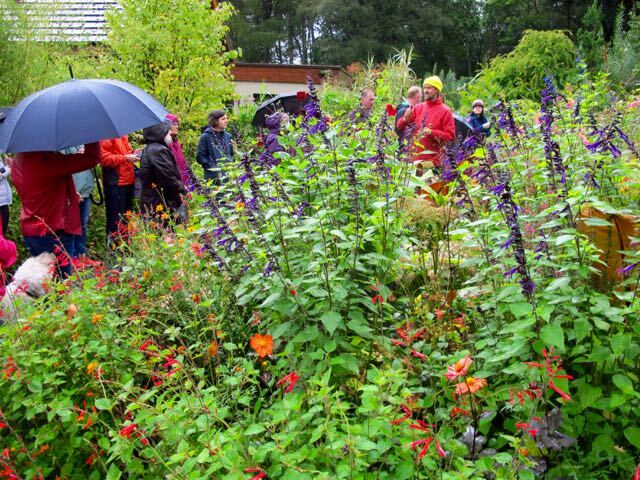 The rain paused, and we returned to the beginning to hear Jimi Blake’s talk on ornamental sage (Salvia). 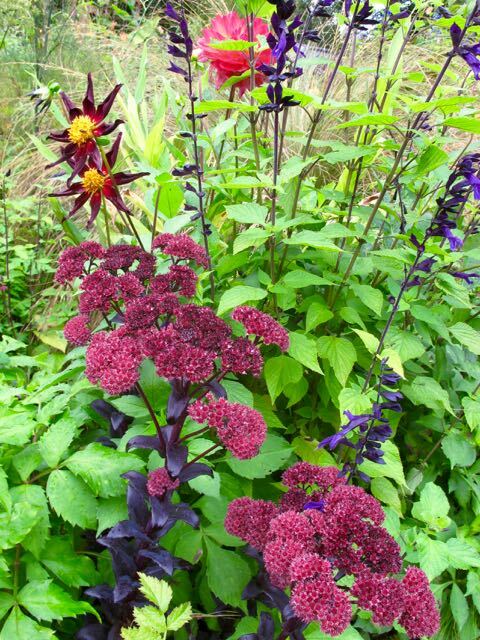 Its height, colour variety, and extended blooming period makes it one of his favourites for the September garden. 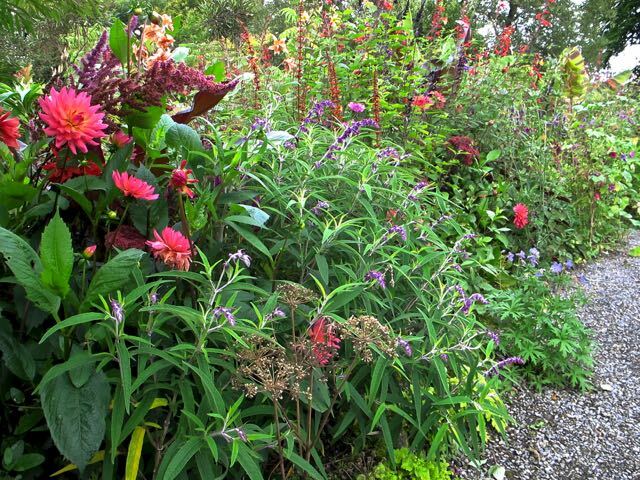 He especially likes the tall ones, which in Ireland are winter hardy or close. 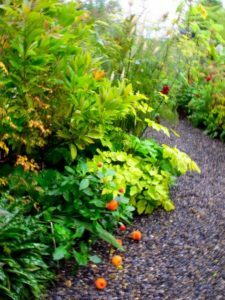 With a few exceptions, most are not for us in Canadian Z6/USDA Z5, though they are available as “annuals” which like zonal geraniums (Pelargonium) are really tender perennials. Imagine being able to just cut these to the ground each year! Luxury. 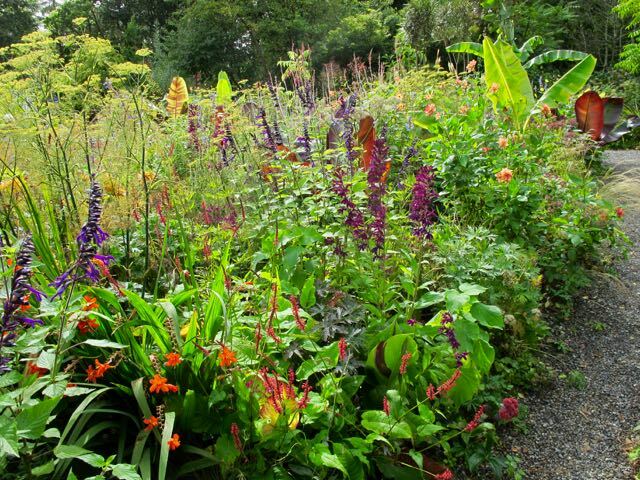 Hunting Brook includes dozens of Salvia species and cultivars. 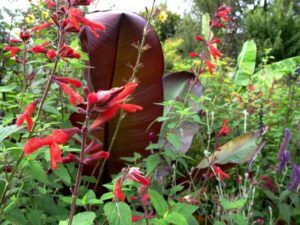 Later, in his sage testing garden, he talked about some favourites, including Salvia ‘Amistad’ (one of the best, in his opinion), S. guarantica ‘Super Trouper’ (a new blue variety), and magenta pink S. ‘Cerro Potosi’ (for him, it blooms from the beginning of June to winter). For the propagators among you, Blake also shared his tips for taking sage cuttings. He’s had great success using pure perlite as his rooting medium! Pots with multiple cuttings go on a propagation mat at about 20˚C/68˚F, and cuttings are repotted into growing mix as soon as roots creep out of the starter pot. If only I had a greenhouse! 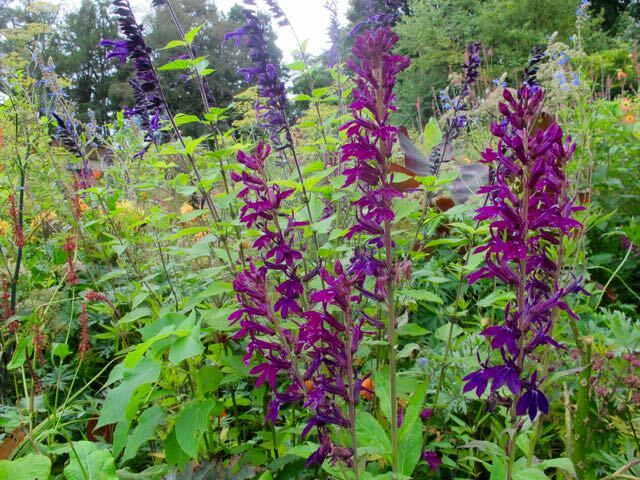 The tall purple sages are S. ‘Amistad’ – similar to ‘Black and Blue’ with dark calyces and purple florets. 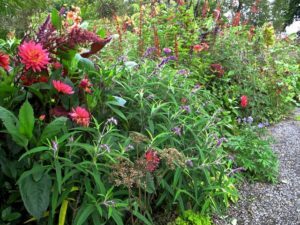 Hunting Brook’s plantings are a tapestry of perennials, tropicals, shrubs and trees, and geophytes or what we generally class as “bulbs.” The one category Blake is moving away from is annuals, relying instead on long-blooming perennials for late-season colour. Just imagine the picture above without sages, for example. 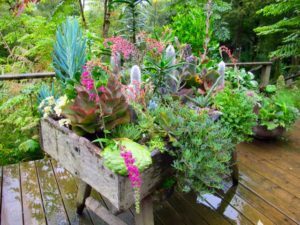 In the back garden, we looked at one of his newer loves, succulents, in two beds on stilts. He used regular potting mix, without grit, for these. Perhaps some are elongating due to the soil fertility and moisture? But I am not a succulent expert. They were dramatic anchors to this outdoor space. Despite the constant drizzle, occasional deluge, and *definitely the wrong shoes, it was a treat to walk round the garden with its creator. 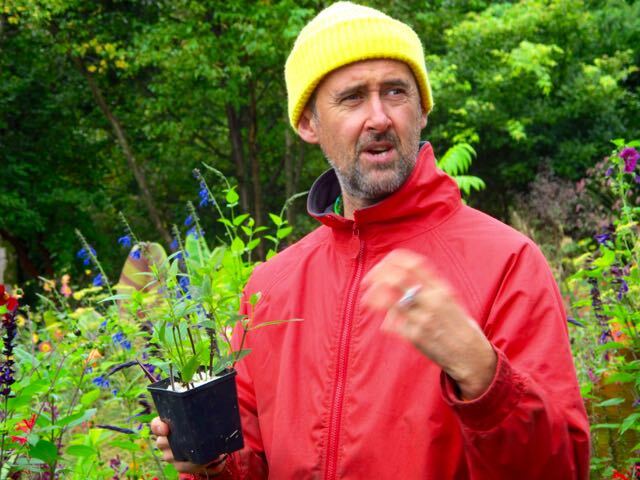 Blake spent nearly an hour with our group, and would give another talk on his top 25 September plants after a break. Stupendous value for our 6-euro entry fee (about C$9)! Meanwhile, we took my wet feet indoors for a hot cuppa and an energizing lunch of almost pure carbohydrates. 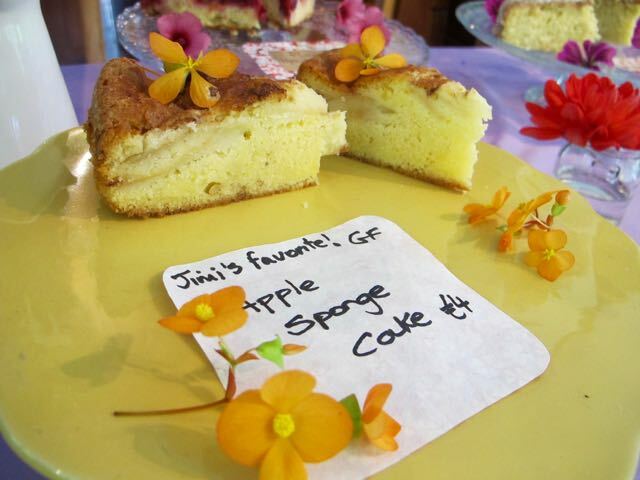 At any time, click any image to see the gallery at its sharpest, though without any captions. The huge red sage flowers on the right belong to Salvia fulgens. And, though not shown here, he also loves the statuesque pink sage Salvia involucrata ‘Bethellii’ which for him can reach 1.5m/5′. Readers in warmer climates, take note. 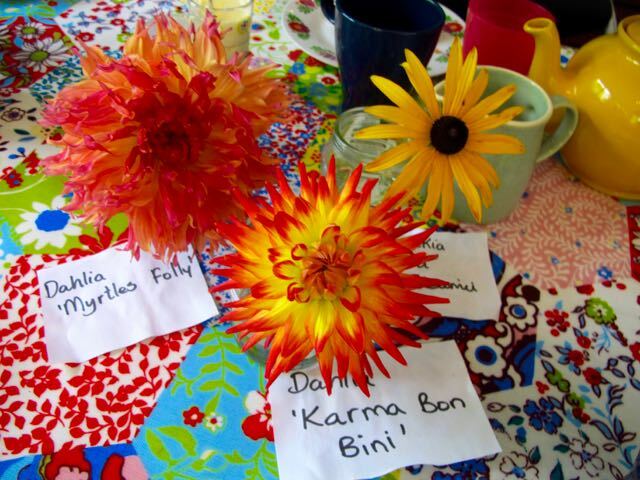 The sun came out momentarily for the second talk on Blake’s Top 25 plants of the month – including sages, the bold leaves of Canna, red leaf banana (Ensete ventricosum ‘Maurelii’) and striped banana (Musa sikkimensis ‘Tiger Stripes’) and a huge array of Dahlia, some of which he grows from his own seed, simply for the surprise results. Not all his favourites are hardy, even for Blake. The Aeonium, cannas, bananas, and the succulents are moved into a hoop house for winter. Corms like a dark burgundy Gladiolus ‘Espresso’ are lifted each fall to keep them dry. A brief moment of sunshine paints a different picture. 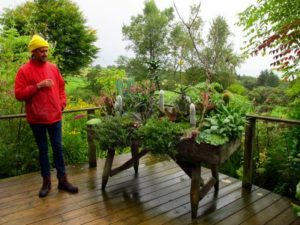 While it was a privilege to listen to Blake go through his plant list, having stood listening for an hour I was itching to look at the garden. I photographed his handout (a garden tour tip I learned years ago), and slipped quietly down the garden path at an opportune moment. 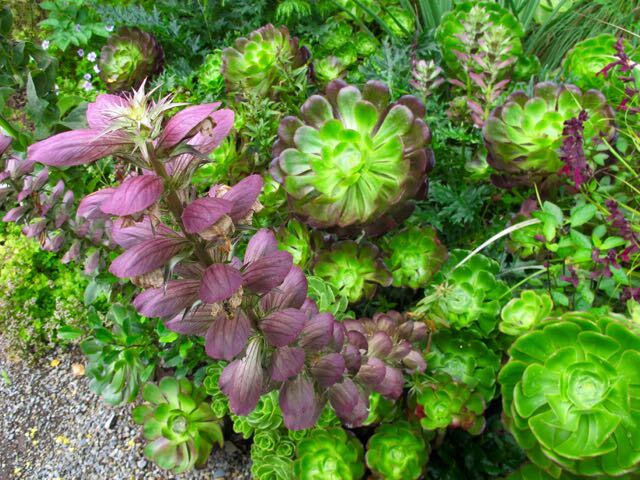 Inspired combination of Acanthus mollis and Aeonium – perhaps a succulent person (if you’ll excuse the term) will tell me which one. From his list, my guess for this gorgeous purple plant is Lobelia cardinalis ‘Hadspen Purple’. 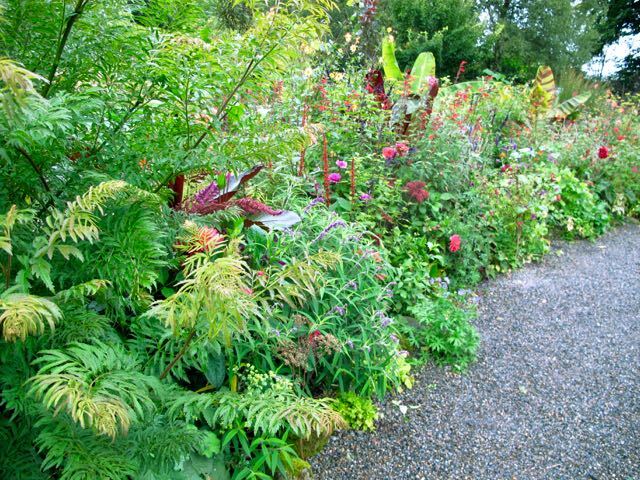 But the RHS gives hybrid synonyms with that cultivar name (L. syphilitica, L. x speciosa, and L. x gerardii). 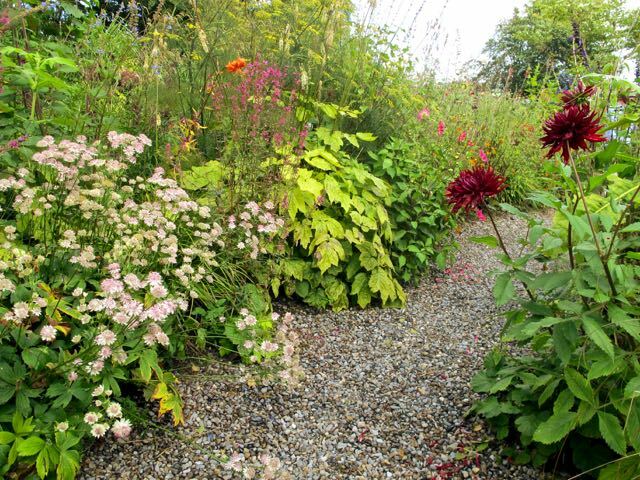 The species is native to North America, so perhaps look for it as a hardy perennial for damp spaces here. The top of the walk through his terrace garden. Approaching the centre of that path. 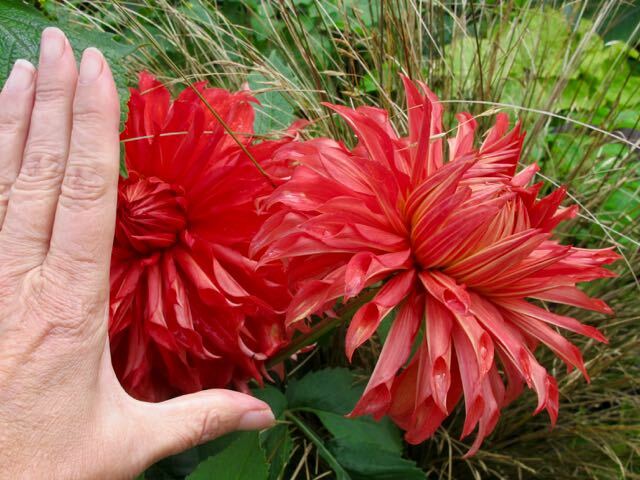 A massive Dahlia – perhaps the ‘Hillcrest Jessica’ on his plant list? Vignette from the cool, green strip running along the top fence. One more look through the central terrace, beyond which Blake is still talking to the crowd. Hunting Brook isn’t all about the ever-changing flower garden. Before leaving for our next stop, we explored. 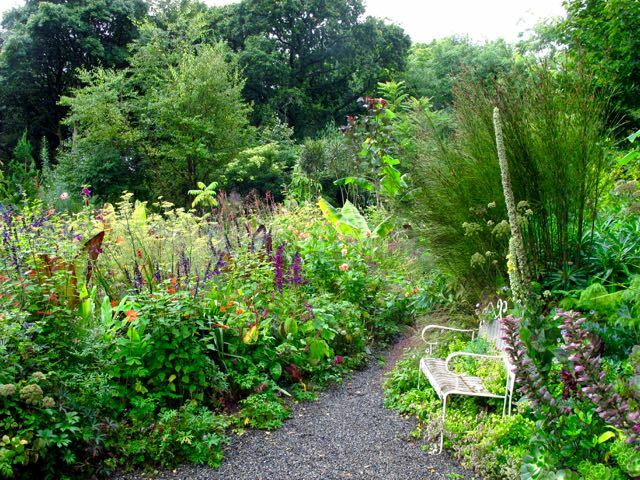 Paths wind into the valley through the woodland, as tranquil and (at the moment) monochromatic as the first garden is stimulating and jewel toned. What goes down must come up. 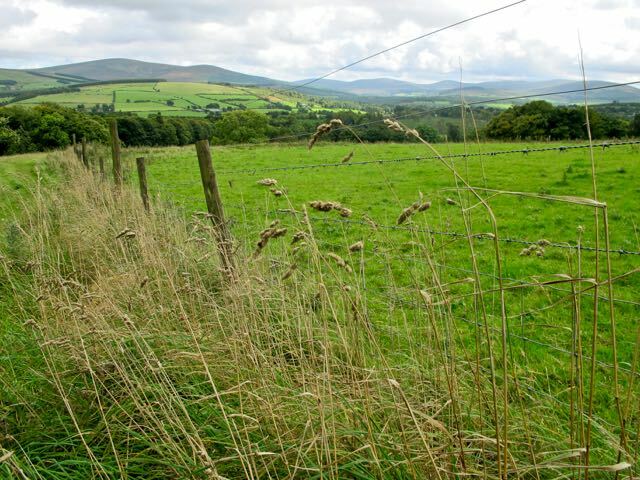 At the top, the far side opens up to the meadow, and this pastoral view. A mown path winds through low grasses to this standing stone. Then back up the mown path on the hill, down the valley, and up the valley again. It was mucky. Did I mention the wrong shoes? And I wanted to have one last, longing look at the garden before heading to our next destination. 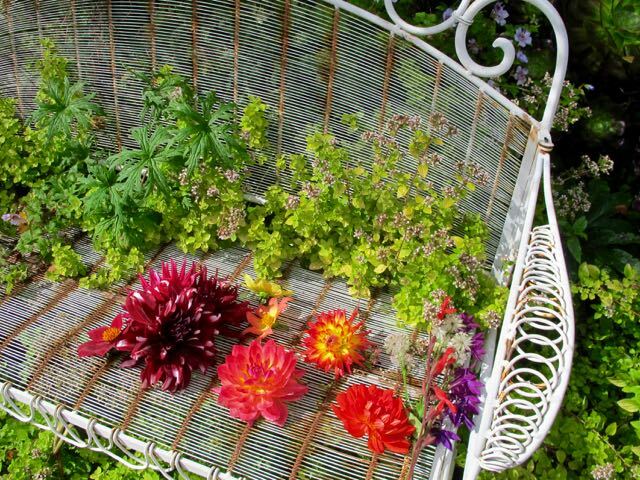 Astilbe, Salvia, dark leaf Sedum aka Hylotelephium, Dahlia. Who would think these would work together? 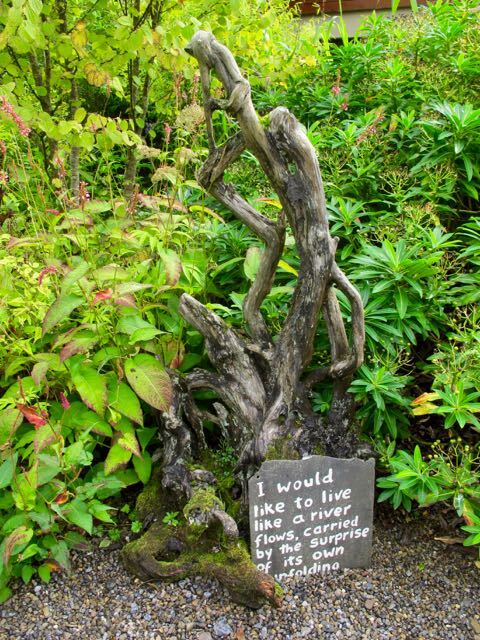 But they do: A rooted bouquet. The beginning of the central path in early September. I’d love to return to see this in other seasons. 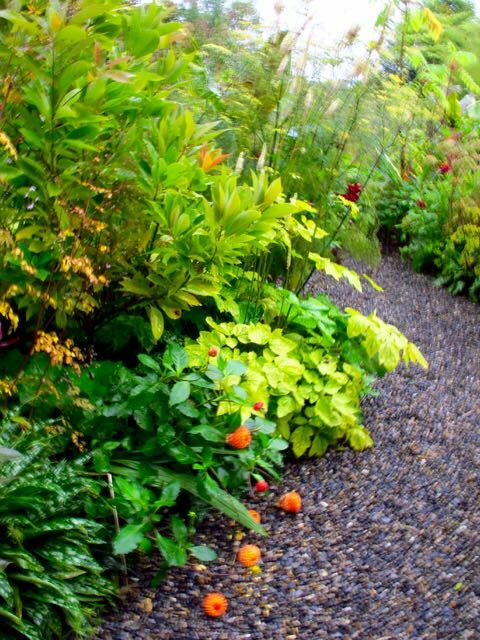 Finally, the path to the back garden where we saw the succulents. The tall purples (centre) are another North American plant, Eupatorium atropurpureum (now called Eutrochium; correct me if I’m wrong). 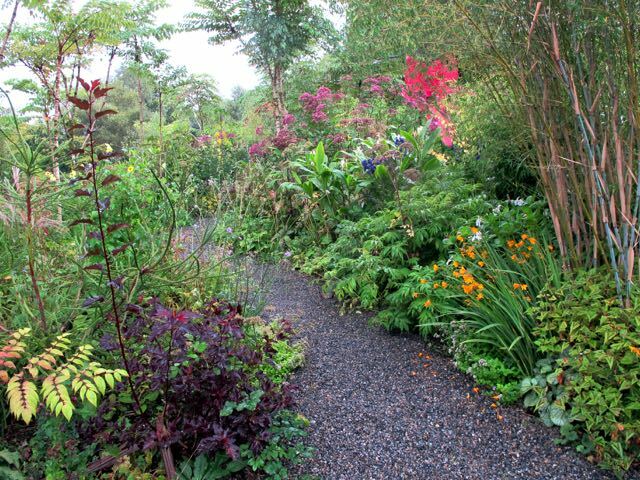 Reluctantly, we had to leave, because our next port of call was the garden of Jimi’s sister, not far away. Closing time was approaching, and clouds beginning to gather again. Stopping to chat with Jimi first, we learned that Paul Zammit, Toronto Botanical Garden’s director of horticulture, had visited just days before. 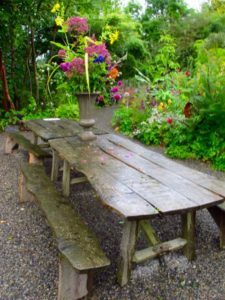 So we’re not the only Toronto gardeners finding inspiration in Irish gardens. We hope you will, too. Coming soon in this series on gardens to visit in Ireland: my look at June Blake’s garden, a very different space. You took a lot of the same images that I did when we were there in August! Jimi is a wonderful human being and it was an honour to visit him. 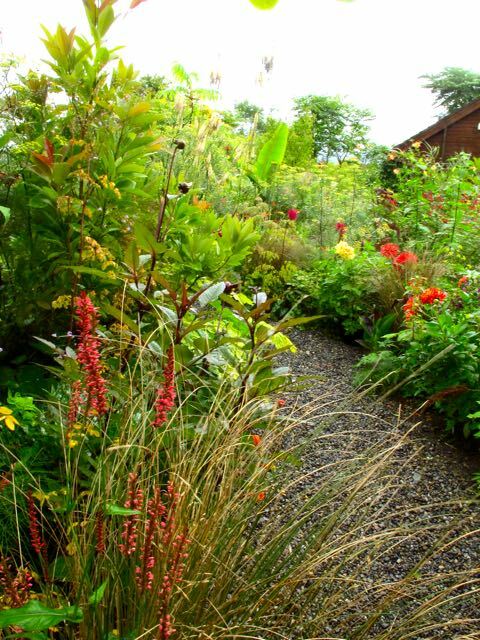 Did you get to see his sister’s garden next door? We did visit June’s garden, Uli, and I’ll be writing about that next. It was an honour to visit Jimi, and he remembered you two very well. Beautiful tour of Huntingbrook Gardens. 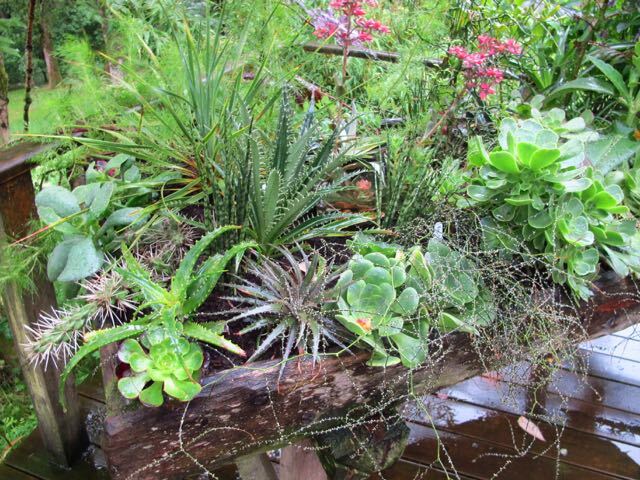 I’m surprised at how many plants we have in common with cool, rainy Ireland. We share a reliance on salvias down here in hot, dry Central Texas. 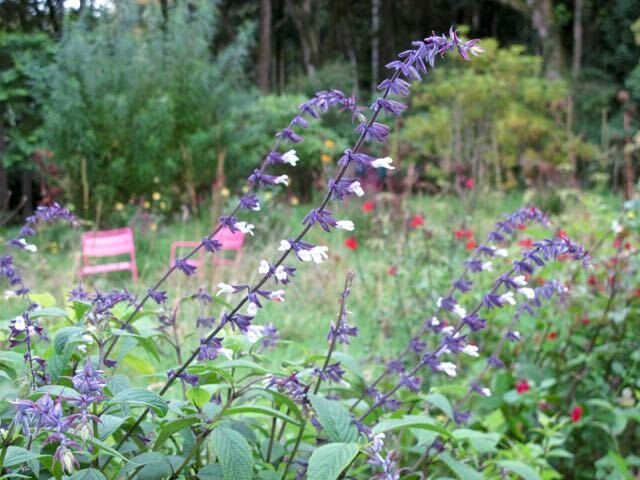 Salvia Amistad is a huge hit in our gardens. I’ve read about Jimi’s gardens from time to time but with your tour and so much about his interest in salvias I will be a follower from now on. Shirley, you must try to visit. 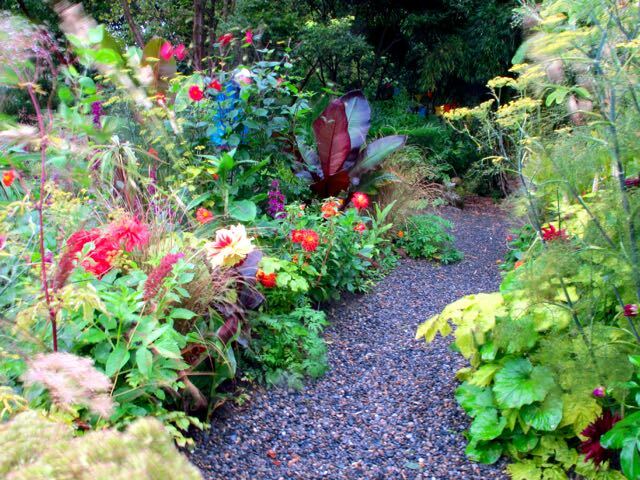 Or head over to his website, where you’ll find other views of this garden at different times of year. It would be great to live next door! 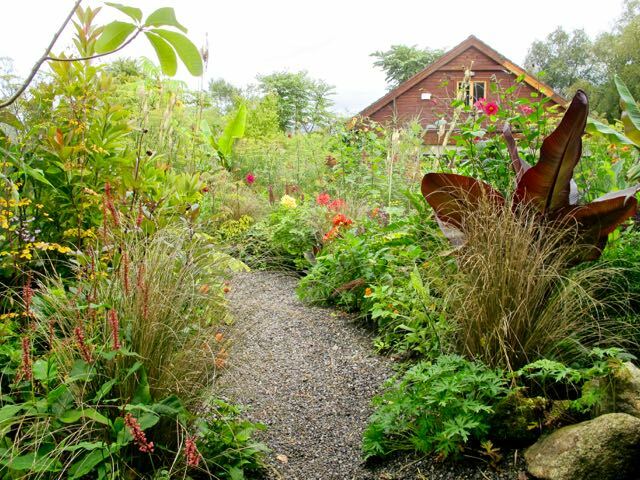 What a great reflection on an exurberant and talented gardener’s garden! The hybrid purple Lobelia is something to look for — two of its parents are native for us, and do well on our woodland garden slope. Perhaps it would be happy with a little less moisture than its parents, too. 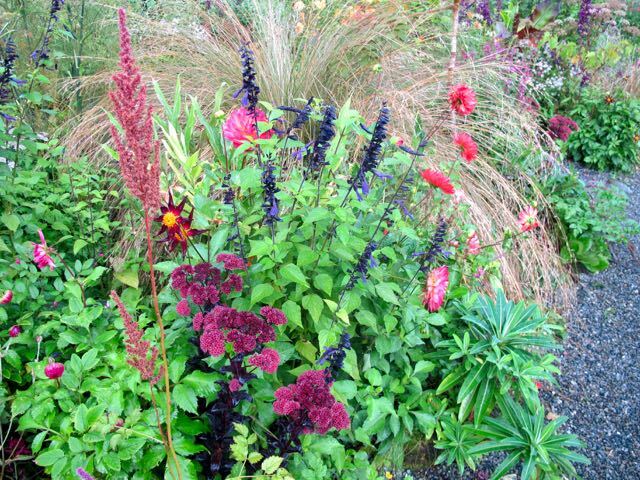 That purple Lobelia is definitely a stunner. My garden is way too dry, sadly. Delightful trek. I am intrigued by the standing stone. Susie, he has the remnants of a couple of ring forts on his property, so perhaps they were vestiges. He has a drone video on his website that shows the outlines of one that’s right next to the standing stone. 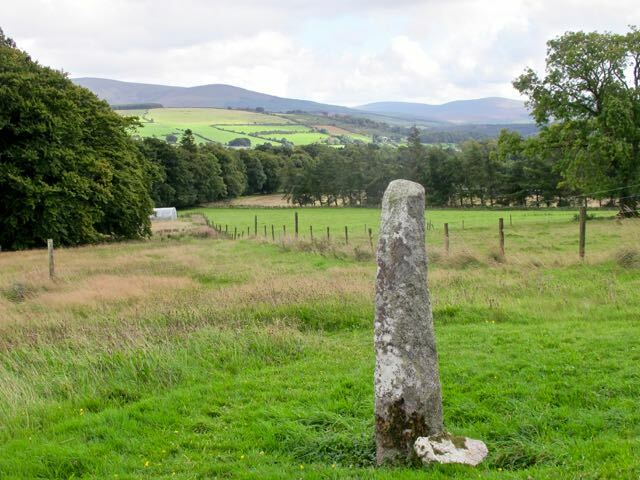 The trouble with Ireland is that you can barely swing a cat without hitting something megalithic. I do feel my luck, Margaret, and am grateful for it. lovely, I hope your shoes have recovered! I know I could look, but the name of his website is ? Thank you for this introduction to a garden I was unaware of until now. 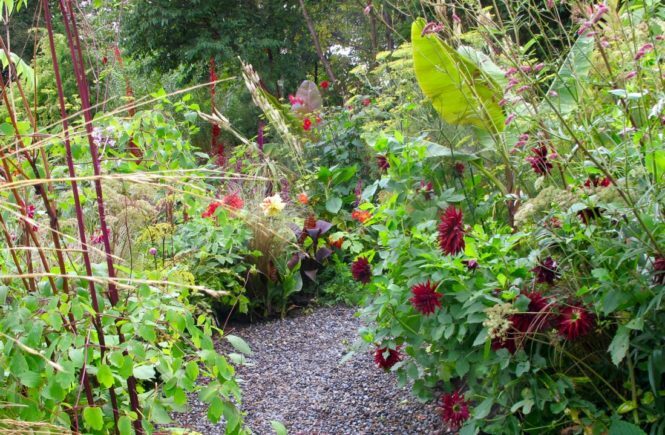 As far as Irish gardens, I’ve been mourning the loss of Helen Dillon’s Dublin garden, so it’s great to know there’s lots more to Ireland, garden-wise! 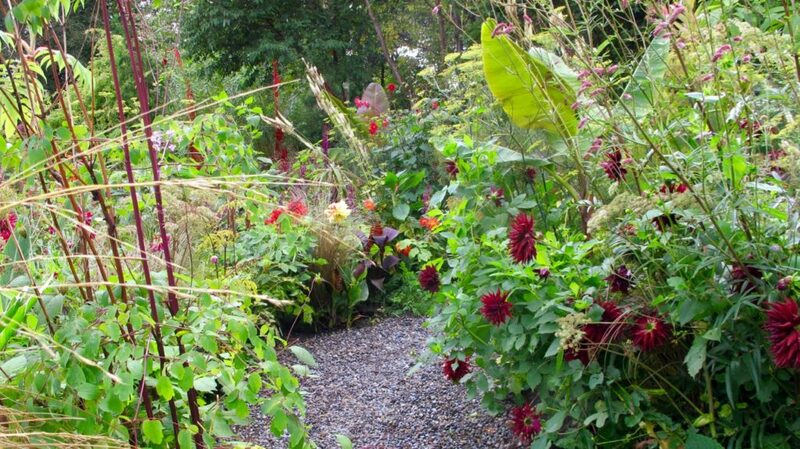 Over the next few posts, I’ll be writing about other Irish gardens I’ve visited, Denise. Fascinating! Do you still have copy of the handout? 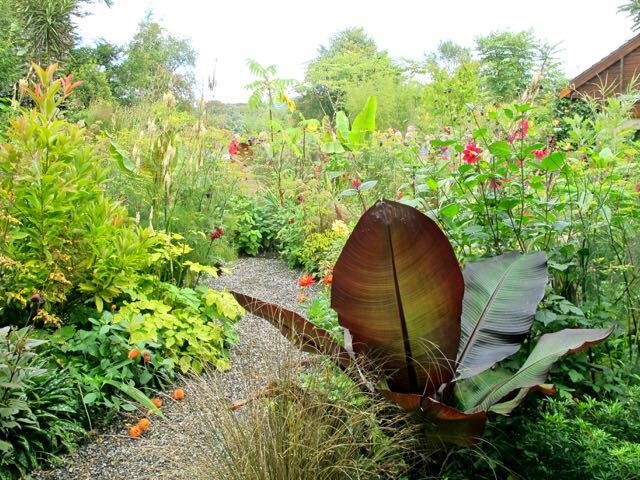 it doesn’t name the grass he weaves in the borders, near that red abyssinian banana? I thought maybe stipa elegantissima, but unsure! Unfortunately not. 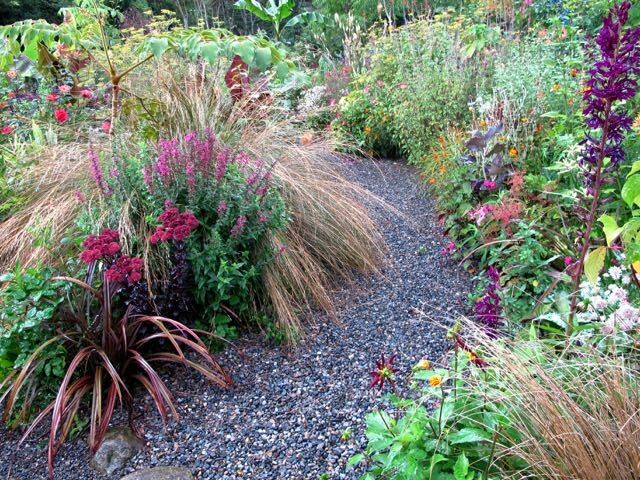 I wish I could confirm, but once I venture past Miscanthus, Panicum or Calamagrostis, grasses are not my strong point.